An earlier version of this story misquoted the tweet. His response: "It depends. 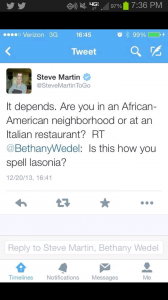 Are you in an African-American neighborhood or at an Italian restaurant."